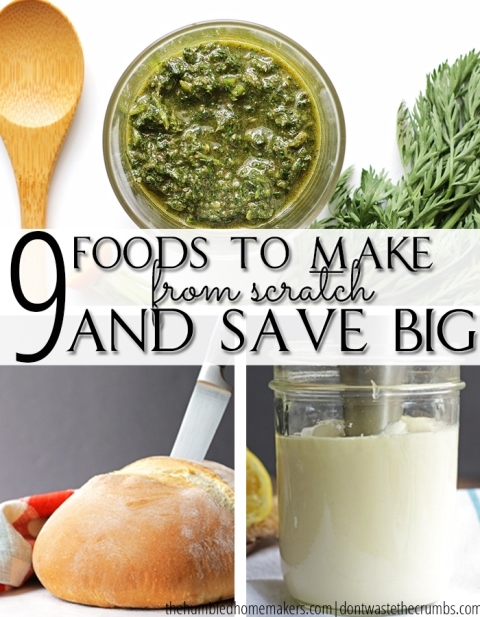 9 Foods You Should be Making Instead of Buying! One of the easiest ways to save money on groceries is to cook food from scratch. But sometimes that’s easier said than done. By making these few items from scratch on a regular basis and making sure to use them up in your monthly meal plan, you can save up to $480 every year! Store-bought bread is often hidden with unhealthy fats and processed sugar, which seems silly when you can make bread with as little as four ingredients. Work Smarter: Make either recipe when you’re already in the kitchen working. If you bake bread the same day every week, it makes monthly meal planning a whole lot easier! Work Smarter: Make a double or triple batch of the dry seasoning mix at the start of the month. Use it on veggies or meats as desired and when you’re ready for dressing, measure out a couple tablespoons and mix! Work Smarter: You can make this in literally 2 minutes, so there’s no need to make it until you actually need it. As the basis of homemade soups and filled with great nutrition, chicken stock is a real food staple. Plus since you’ll already have bones if you buy chicken, no special ingredients are needed. Work Smarter: Make a batch of stock at the beginning of the month and store all the remaining bones in a freezer-safe bag, in the freezer. Add additional bones to the bag as the progresses, and when you’re down to one quart of stock, start another batch with the bones before you go to bed using the slow cooker method. Repeat this process and you’ll never run out of bones for stock! A few weeks of hiding in the cabinet turns apple cores and peels – originally destined for the trash – into delicious and versatile homemade apple cider vinegar. In our kitchen, apple cider vinegar is most often used for homemade salad dressings and chicken stock. Work Smarter: Collect apple cores and peels as you go through apples, storing them in a freezer-safe bag in the freezer. When you have about a half-quart worth, make a quart of vinegar. I haven’t met a single kid who didn’t like a popsicle, and parents can join in when they’re made at home without all the fake sugar. Work Smarter: Since any fruit juice and puree can be turned into a popsicle, save the juice from all canned fruit and puree any beyond-ripe fruits and freeze separately in an ice cube tray. Store frozen cubes in a freezer-safe bag and when there’s enough, re-blend cubes to achieve the desired flavor popsicle. Bonus Tip: Add homemade yogurt to the popsicles for a boost of probiotics! Okay, so we don’t exactly “make” green onions, but it’s close! Green onion, lettuce and 8 other foods will regrow in water. Work Smarter: Make oat flour when you already have the oats out, making traditional porridge or oatmeal chocolate chip cookies. Run the blender while you’re already in the kitchen waiting on the oats to cook or as the cookies bake. Work Smarter: Save random, small bits and pieces of nuts for this recipe instead of using whole nuts.